Good News! Last Friday we held the print version of 'Islands of Cats' for the first time in our hands and were able to pick up the long awaited books in all 3 languages: English, German and Maltese. 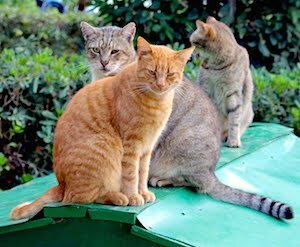 250+ colourful photographs on 128 pages talk about a representative 22 of more than 1,000 carers of stray and abandoned cats in Malta and Gozo and their admirable work. Also, read about places of interest close to these individual's locations, interviews with specialists, cat facts and more. Aiming at anybody who cares for animals, author Alexander Johnson explains: "There seems to be an affinity between a part of the Maltese population and the Islands’ feline citizens. These individuals who see to the cats’ needs, the importance of which is underrated, are called: carers or feeders. In our quest to find out more about these mostly shy and reserved caregivers, Gabriele and I met carers from all walks of life - housewives, business persons, room maids and doctors, Maltese, Gozitans, and foreigners - people who give up part of their daily lives to be dedicated and loyal knight-errants, sustaining and protecting their own ‘islands of cats’. And by having this fertile species neutered and spayed, keep the cat population at bay." Author Alexander Johnson at the stand of BDL Books during the Malta Book Festival 2016.